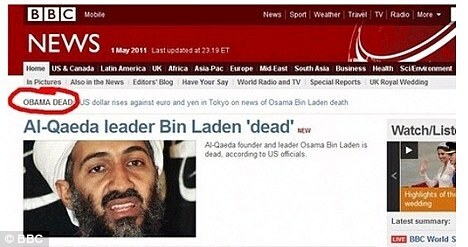 Why we keep calling Osama "Obama"
"Obama bin Laden": The gaffe has been made so frequently by so many media outlets over the past few days (including Salon) that it has almost become an idiosyncrasy of the bin Laden death story. It is tempting to read too much into the conflation (are you calling the president a terror leader?) or to look past it entirely (the names sound similar, big deal). But we contacted linguists and speech pathologists to glean more about the mechanisms that might be behind the mix-up. Names are typically odd in this respect as they don't have any inherent meaning. Nevertheless, confusing two names that are similar sounding about people who are connected in some way can certainly arise as an honest error. On top of their similar sounds, it's likely that the similar 'roles' Obama and Osama have played (as geopolitical figures) contribute to these mistakes. Research has shown that people tend to mis-name celebrities, they make confusions related to their social roles -- for example, calling President Kennedy "President Reagan." But this doesn't mean that when people make these errors they think Kennedy and Reagan have similar ideas -- it just means that they were both president. Interestingly, Harriet Klein, a professor of communicative sciences and disorders also at NYU, pointed out the difference in calling Osama "Obama" to calling Obama "Osama." 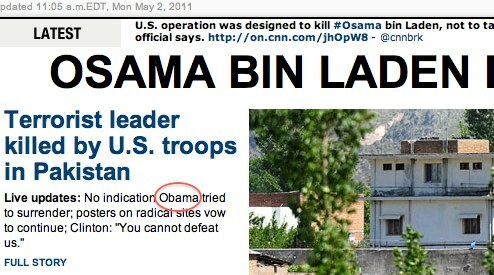 Most of the flubs this week have involved calling bin Laden "Obama," and there is physiological accounting for this. In a process known as assimilation, Klein explained, we anticipate the "B" from "bin Laden" and this influences the "s" in "Osama" to turn into a "b" ("Obama"). "And 'b' is a much less complex sound to form than 's'," said Klein. The other way round, however, there's no such physiological explanation. "It seems more derogatory to call Barack 'Osama' ... It feels almost more psychological," said Klein. The recent mistakes, therefore, being almost entirely examples of calling bin Laden "Obama," may well be explicable as examples of assimilation. But as Buchwald noted, "one important caveat here is that this does not mean that all such 'errors' are unintended." 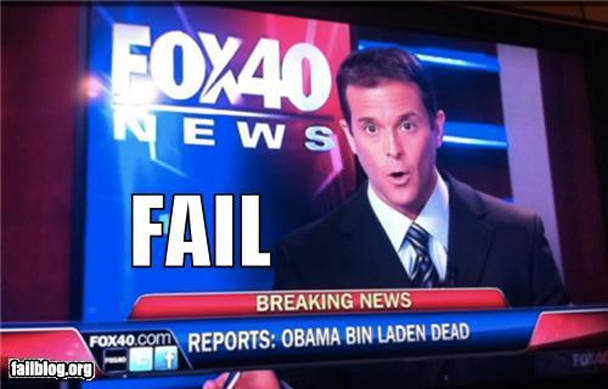 Following President Obama's announcement of the al-Qaida leader's death Sunday night, an anchor for New York-based Fox 5 said, "President Obama is in fact dead," before correcting himself after some prompting.